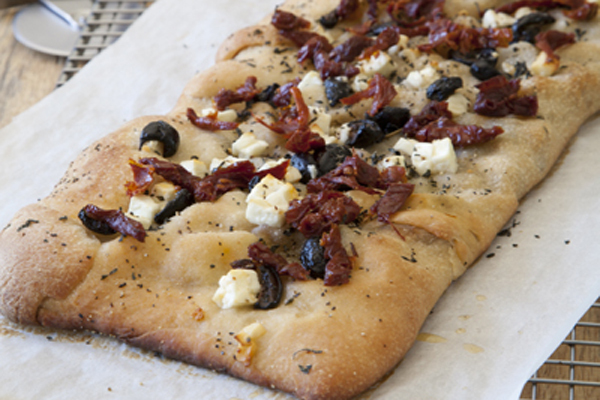 Ready set, bake this fast and easy focaccia bread recipe using store bought dough. Store bought dough turned into some of the best Italian style focaccia bread you will ever make. Preheat oven 400º F and line a cookie sheet with parchment paper. Lightly sprinkle your work surface with flour and roll out the pizza dough to a 12” x 12” square, sprinkling more flour when needed. Transfer the dough to the baking sheet. Brush the top of the pizza dough with olive oil. Top with the remaining olives, feta cheese, oregano, tomatoes, and black pepper. Bake for 15-20 minutes, until edges of pizza dough are golden brown.